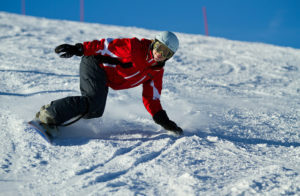 Tens and tens – and tens – of thousands of people will attend the 2019 Sundance Film Festival this year, with venues spread across Salt Lake, Sundance Resort, and, of course, right here in our very own little Park City. More than 40,000 people will make our town their basecamp for the festival, and you’re likely already experiencing the impact in your daily life. The 10-day event starts off with an influx of humanity, which leads to packed streets, restaurants, and venues. With this combination, things are bound to get jammed up. Sign up for alerts from the Festival and the City by texting FILMFEST to 888777. Notifications about traffic, closures, weather, and emergencies will be sent out. There are, of course, parking closures, changes, and alternatives right off the bat. The image below, from the City, shows where those are. Now more than ever, Park City’s free public transportation system is the most efficient way to navigate the crowds! 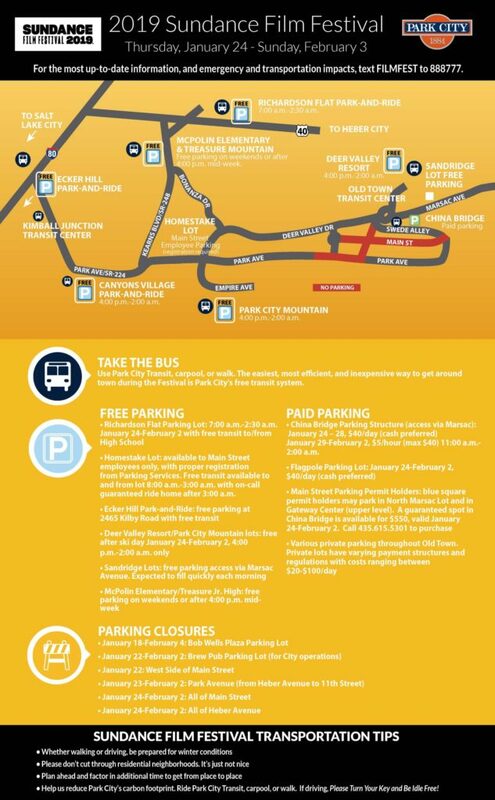 If you are doing the film routes, make sure to utilize the Sundance shuttles, as there is no public parking at Festival theaters or venues — and no parking of any kind on Main Street. And – be aware – parking at China Bridge is $40/day – and that’s without re-entry. One big bonus during Sundance – it’s some of the best skiing of the year! The mountains are relatively open since most of our visitors are watching screens instead of hitting the slopes. Take advantage of it while you can! This year, more than 14,200 film submissions were received, a record-breaking number, and the applicants represented 152 countries. From those, 112 feature-length films were selected to be screened, with 33 countries represented and 45 first-time filmmakers. There are quite a few guides to be found, and if you’re a diehard Sundancer, chances are you’re already wearing your lanyard and your docket is full. For the rest of us, Park City Magazine has created “Sundance for the Casual Festival Goer.” With tips like focusing on early and late screenings, taking advantage of Townie Tuesday, and enjoying Best of Fest (our personal favorite way to enjoy Sundance – you’re just about guaranteed to enjoy a terrific film and it’s not too crowded), it’s worth scanning the list. 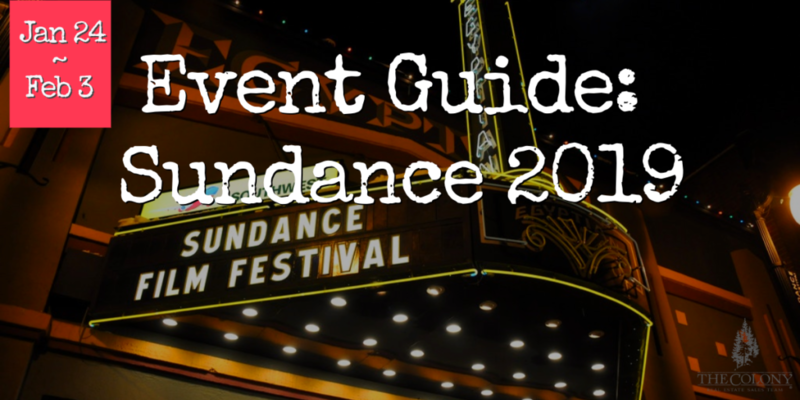 There are about a million and two things to do offscreen – and these are just the official Sundance events! There are dozens and dozens of panels: Power of Story, Cinema Café, New Frontier Panels, Festival Panels, and Partner Panels; music options, parties, private screenings, and so. many. Sundance. sponsor. activities. The ASCAP Music Café celebrates how absolutely critical music is to the movies, and “honors the love affair between music and film with eight days of performances from artists and songwriters you need to know (and some you already know).” The Café is open to all Festival credential holders (ages 21+). Whether you get out of town for the first Fest weekend or are here and cursing the traffic, keep in mind that nearly 125,000 people attended last year’s Festival → which generated $191.6 million (!) in economic activity for the state of Utah, and supported more than 3300 local jobs. It may not make waiting on 224 any less annoying, but it certainly does its part to keep our economy strong! 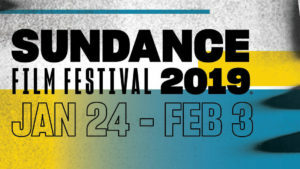 The 2020 Sundance Film Festival will take place January 23 – February 2, 2020.